Don’t let your silver goods lose their sparkle by following our practical advice and using our excellent silver cleaning products, which can be found on our Silver Cleaning page. A simple wipe with a silver cloth every two to three weeks should be enough to keep your silverware in good condition. After a period of time you might find some tarnishing on your silverware, which is simply removed by using one of the cleaning products available from celticdesirejewellery.com. This process should only be required twice a year depending on the conditions your silverware is stored. After a period of time your silverware may become tarnished, which is easily fixed with a good quality polish and soft cloth. At celticdesirejewellery.com we have a range of Hagerty silver cleaning products, which can be found on our Silver Cleaning page. 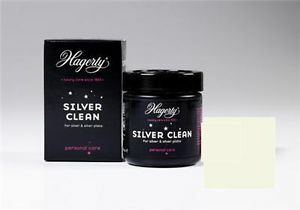 Hagerty Silver Clean is a specialised bath for silver jewellery that removes tarnish instantly and restores the original shine. 1. Immerse jewellery in dip basket, then swirl or agitate it for a brief minute. 2. Use sponge for heavier soiled or larger items. 3. Rinse and dry with a soft cloth.